Roof Replacement: Why Choose Asphalt Shingles From Your Roofer? Without a doubt, asphalt shingles are the most popular type of roof covering in the United States. While other types of roofing is becoming more popular — such as metal roofing, tile roofs, and wood shake — asphalt shingles still continue to dominate. Have you ever wondered why? That’s what we’re going to talk about today. But before we do that, let’s take a look at what an asphalt shingle is. What Is An Asphalt Shingle? While most people see thousands of asphalt shingles every day, they’re so ubiquitous that we don’t really even see them at all. Most people also don’t know what they’re made of, even if they sleep under them every night. Base Material – The base material that is on the underside of a shingle is often made of fiberglass or organic felt. As the name suggests, it forms a base for the other layers of the shingle. Asphalt – When most people hear asphalt, they immediately think of an asphalt road. Both the asphalt on a shingle and in the road are made from a highly-viscous form of petroleum. Yep, you’ve got oil on your roof if you have asphalt shingles. Asphalt is used because it is a pliable and long-lasting waterproof material. Surface Granules – The surface granules are the topmost layer of the shingle and are made from tiny rocks. The surface granules that are attached to the asphalt layer serve many purposes. First of all, they protect the asphalt layer from UV rays. (Petroleum is organic and can be broken down by the sun’s rays over the years). They also provide the color of the roof, and add a layer of fire protection. 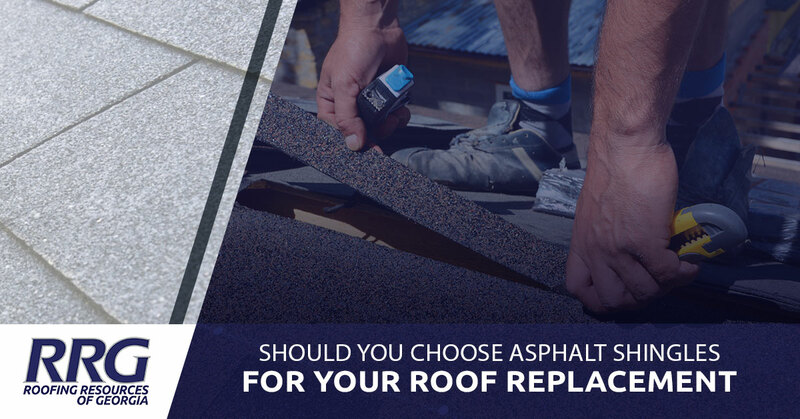 There are many reasons why asphalt shingles are the most popular type of roofing in America, but it’s also important to know why you might choose a different kind of permanent covering during your roof replacement. Shingles Are Easy To Install – Well, we should say that asphalt shingles are relatively easy to install, especially when compared to other types of roofing like clay tiles. As we discussed in this article, you could attempt to replace your own roof, but there’s really no reason to do so. A professional can get the job done better and faster, and your insurance might pay for it anyway. On top of that, having professional roofers take care of your roof replacement ensures that you won’t get seriously injured…or worse. Shingles Require Very Little Upkeep – For most of the time that they’re on your home, shingles aren’t going to require much upkeep. New shingles seldom cause the need for roof repair, and they’ll hold up to standard weather events. If you notice moss start to grow on them, you might want to have a professional roof cleaner come and remove it. Shingles are Lightweight – Shingles are one of the lightest forms of roofing material. This is an advantage because they don’t require the roof to be reinforced before they are put on. Tile roofs often require the underlying roof to be reinforced due to the great weight. Shingles Are the Least Expensive Option – Of all roof replacement options, shingles tend to be the least expensive. The bulk of the reason for this can be attributed to the previous advantages we’ve already mentioned, and the fact that they can be easily be mass-produced further makes them the least expensive option. Shingles Last – While metal, slate, and tile roofs all last longer than a shingle roof, shingles certainly don’t give out quickly. Most shingles won’t need to be replaced for 20 to 30 years, and the highest grade of shingles can actually last nearly as long as metal roofs! Shingles Have Many Color and Style Options – What color shingles do you want? There’s a really good chance that your roofers can accommodate (though your insurance might make you pay a surcharge for some colors). And while most shingles look the same, they don’t have to. You can choose different styles to match your home, such as laminated or 3-tab shingles that will give a very different look. Some even have extra coatings on them to reflect more of the sun’s light away from the house. Shingles Shouldn’t Be Installed In Freezing Temperatures – Singles are meant to be pliable, and the sticky coating on them are supposed to…well, stick. This is one aspect that we don’t have to worry about too much. While it does sometimes freeze here in northern Georgia, there are still enough warm (and hot!) days to install shingles that the freezing days aren’t affecting our schedule very much. They Are the Shortest-Lived – Like we said above, shingles last quite a long time. But if you are planning on being in the same house for the next 50 years, the 20-30 year lifespan of typical shingles might upset you. Considering most people don’t plan on putting two or three roofs on during their lifetime, shingles are perfectly fine for most people. Extreme Heat Can Shorten Their Life – Asphalt shingles in Georgia tend to last about 20 years, but they can last longer in other parts of the country. Extreme heat, as well as extreme temperature fluctuations, mean that asphalt shingles don’t always do as well when they expand and contract. They’re Not As Environmentally Friendly – As we noted above, asphalt shingles are partially made from petroleum. That means pumping the oil up out of the ground (or digging it out) and refining it to shingle-grade asphalt. In addition, when the shingles are replaced nearly all of them head to the landfill. There are efforts to find a way to recycle them, but they’re not nearly as recyclable as, say, a steel or aluminum roof. Are Asphalt Shingles For You? We’d love to help you make the decision about what type of roofing material you might choose during your roof replacement. Contact us today to get the process started!